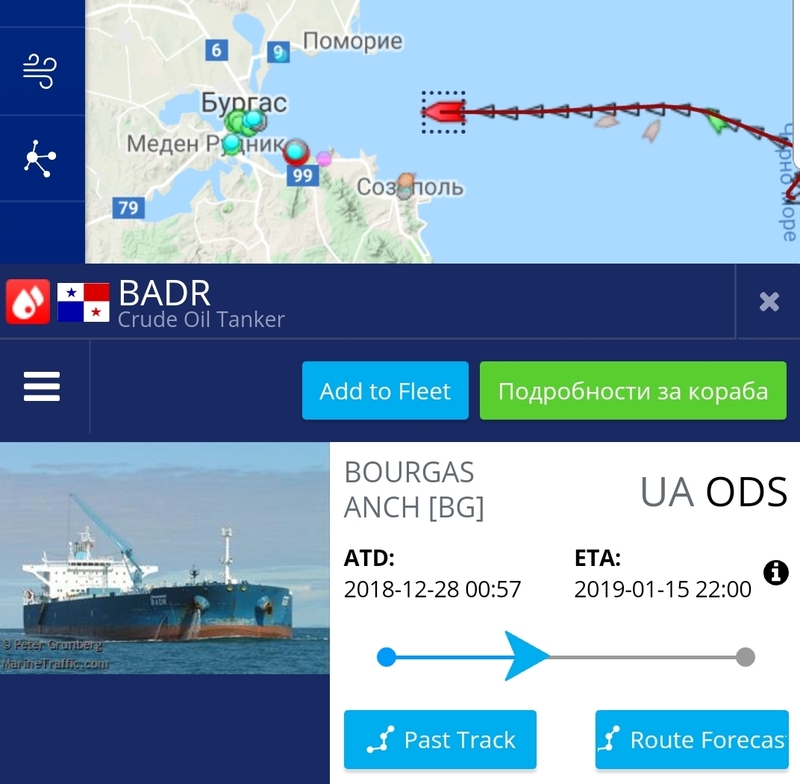 The Panama Maritime Authority had launched as early as December 27 a procedure to withdraw the flag of the Libyan tanker BADR abducted during a pirate raid in the Burgas Bay on the southern Bulgarian Black Sea coast. This had been done after an inquiry from the Bulgarian side dated December 24 and whose answer had been that the technical certificates presented by Bulgargeomin DZZD are counterfeit. On January 14, at 5 pm Bulgarian time, the phantom tanker picked up anchor and sailed to Odessa, but was brought back in the middle of the night after an impressive loop in the open sea, satellite maps published by Maritime.bg show. According to the AIS navigation system, in the wee hours of January 15, BADR had already entered Bulgarian territorial waters and had been moving slowly towards the Burgas Bay, from which it started its journey on December 27. There is nothing else left, but for it to be arrested by Maritime Administration because of irregular documents. This is the BADR/ BDIN’s second attempt to escape after the pirate raid. Its first course to the Bosporus was thwarted by the Turkish authorities and the ship was returned from the border. Since then, it has been at anchor outside the 12-mile territorial zone of Bulgaria, so as not to be arrested in the midst of the scandal. Bivol is in possession of documents that make it clear that in order to free the ship, Bulgargeomin DZZD has presented to Maritime Administration completely fake documents. All security certificates, as well as the temporary Panamanian Navigation License under number 000265462, have been forged. Although Maritime Administration had been aware of this fact, they continued to claim that they had received confirmation from the Panamanian authorities that the ship had proper documents. Namely, Maritime Administration has revoked BADR’s arrest after an illegal change of ownership and flag, and has let it sail free despite the massive falsification. Part of the conversation (in Bulgarian) with Mr Zhivko Petrov, Head of Maritime Administration, held on December 31, four days after the Panamanian flag was reported as fake by Panama’s ship register. The Panamanian flag license is dated December 13, 2018 and is from the Panamanian consulate in Athens. However, the internal investigation of the Panamanian diplomatic and maritime authorities has found that all certificates in the Panamanian ship register, stating the change of the flag and the name BADR with the new name BDIN are fake. It became clear earlier that the maritime mortgage, on whose grounds the tanker’s ownership claims had been made is also fake. A Greek notary has reported to the Prosecutor General’s office in Athens that her signature and stamp have been falsified. Bivol talked on the phone with notary Andreadaki and publishes her confirmation of the latter on December 31, 2018. The Bulgarian Prosecutor’s Office had been working on the case with the fake mortgage since July, according to recent statements by the Burgas District Prosecutor. Until now, among all Bulgarian institutions, only the Prosecutor’s Office has shown some activity by indicting private law enforcement agent (PLEA) Totko Kolev. However, Kolev publicly announced that the December 21 raid, during which the tanker was seized by thugs with the help of border police and Maritime Administration, had not been at his request and he had not even been in the country at the time. On the same day, the Burgas District Court ruled that the refusal of PLEA Totko Kolev to suspend the execution of the transfer of the tanker’s ownership to Bulgargeomin had been illegal i.e. by virtue of a previous court ruling, Kolev had been mandated to suspend the transfer. Instead of this and for BADR to be able to sail freely, according to the final ruling of the Supreme Court of Cassations, the Bulgarian authorities, represented by Maritime Administration and border police, together with police officers dressed as private security guards, seized the ship at gunpoint, beat and forcibly removed the crew, replacing it with a Ukrainian one. In addition to the prosecution, all other authorities, including the Ministry of Interior, Maritime Administration, the Ministry of Foreign Affairs, and the Transport Minister argued in unison that this is a private dispute and that all of the actions of the institutions had been correct and without any problems. There is no reaction yet by the Ministry of Interior, despite the evidence presented by Bivol that an active police officer had been part of the team of private security guards of the private security company Bashev Team & Security in violation the law. Bivol revealed that Alexander Vassilev Longochev, a policeman from the special police task force in the Bulgarian capital (SPS-Sofia), has boarded the BADR tanker dressed in a security guard uniform of Bashev Team & Security. He has been recognized by the ship’s Captain Abdullah Abdul Jalil as one of the people who hijacked the tanker on December 21, 2018. According to our sources, Longochev has not been the only employee of the Ministry of Interior in the role of a thug during the hijacking, but an investigation by the Interior Ministry and a reaction by the Interior Minister are missing, which can be interpreted as a clear indication of the State’s involvement in the criminal act. Moreover, according to data from the Ministry of Interior’s registers, the company Bashev Team & Security did not and does not have a license for security activities. It is still to be established whether the thugs have been authorized to carry weapons. The certified and notarized testimonies by the Captain and the crew of what happened on December 21 speak persuasively of an armed attack by civil servants and thugs who had abused and humiliated sailors aboard BADR. The entire unparalleled criminal act was carried out with the aegis of Maritime Administration and border police, making the respective Ministers responsible for the unprecedented torture and subsequent international scandal. Bivol calls on the Prosecutor’s Office to launch an investigation against Transport Minister Rosen Zhelyazkov and Interior Minister Mladen Marinov as responsible for the cooperation and complicity of their institutions into the carrying out of this mafia hijacking. The testimonies and the stories of the Captain and the crew can be read translated in Bulgarian without any edits and changes here and here.